Air travel has the biggest impact on the climate per trip, but travelling long distances alone by car could be just as bad for one's carbon footprint, a new study has found. The study was conducted by researchers at the International Institute for Applied Systems Analysis (IIASA) and the Centre for International Climate and Environmental Research – Oslo (CICERO) and published in the journal Environmental Science and Technology. The researchers compared the climate impacts of different forms of transport for a travel distance of between 500km and 1000km, typical of business or holidays trips. The researchers calculated the carbon impacts of various forms of transport by considering vehicle occupancy, fuel efficiency and climate impact over time. Jens Borken-Kleefeld, Research Scholar on Mitigation of Air Pollution and Greenhouse Gases at IIASA and co-author of the study, said the formula was globally applicable. "We took the example of Europe because we come from here and we understand the transport systems here, but the chemical and physical mechanism works the same," he said. "If you want to adapt the study to Australia, I think you have to choose the right aircraft – this isn't a big deal because there's only two air companies globally, so it's either Boeing or Airbus that you're flying. The trickier variable is the amount of pollution that's coming out from the engines." 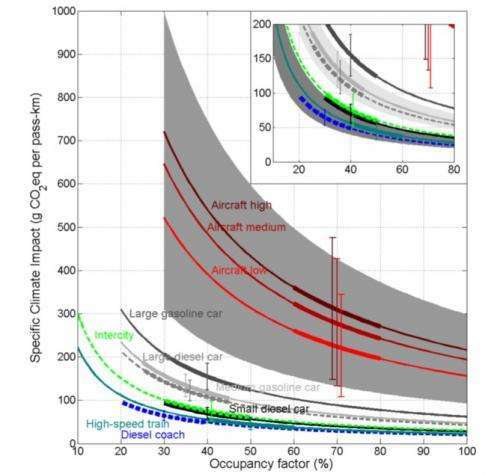 Aviation was shown to have the biggest climate impact per person per distance travelled. Its climate impact was shown to double when "short-term climate forcers" such as condensation trails that form behind travelling aircraft, thin wispy clouds called cirrus clouds and ozone were taken into consideration. The study showed that even a couple of passengers in a small diesel car could leave a smaller carbon footprint than the average coach or train, which are shown to have the least climate impact on the whole. "Here we differentiate load factors so that if you look at the diagram you can read that, 'OK, this is the number of passengers in my car, this is my climate impact'," Dr Borken-Kleefeld said. "Now you can compare it and see what would be the equivalent if I travelled on train or if I took the aircraft?" Dr Borken-Kleefeld said his study's conclusions could be useful for transport policy-makers. Cameron Gordon, transport economist from the University of Canberra, thought the results were "generally transferable" to an Australian context, but the method to obtain them was "all too simple to get a more definite measure of emissions based on travel choices in a particular city or region or country." Professor Gordon, who was not involved in the study, said it would be difficult "transferring the results from Germany, which has a certain road network, and of course no maximum speeds on their autobahns [highways] – which would be worse for emissions, per mile travelled by car – to the kind of conditions we have here, with lower speeds and longer distances." Dr. Borken-Kleefeld agreed, but pointed out that key to the climate impact from car travel is the fuel economy. "Hence transferring our findings to Australian cars means adjusting for the local fuel economy, and then you can essentially read off the result," he said. Jago Dodson, Director of the Urban Research Program at Griffith University, said that the study was easily applicable to the Australian context. "Our vehicle-emissions profiles would not be completely different to those in Germany, and it would give you some indication of the relative carbon impact of the different modes of travel between say, Sydney and Melbourne or Sydney and Brisbane," said Associate Professor Dodson, who was not involved in the study. "Where the study might be of interest in Australia would be around debates about the high-speed rail project, or the potential for constructing high-speed rail links between Sydney and Melbourne," he said. "What the study does indicate is there's a fairly substantial climate impact saving from switching away from aircraft to trains or diesel coaches, so certainly this could be used as a starting point for further consideration for a high-speed rail option." Slow to arrive, but will Australian high speed rail be worth the wait? There isn't one? That's surprising. The benefits of constructing one sounds like a no-brainer to me (especially with Canberra right smack between the two). What a stupid and misleading headline! I get 80 passenger miles per gallon with my Echo.. Worse, you are at increased risk of accidental exposure to the kind of toxic squawk radio that fuels the paranoid fantasies typical of certain commenters at this site. Take a good music collection or be prepared to scan a lot. Why? You don't have the power or technological know-how to tune your radio to the "unbiased", "objective" squawk provided for you by the taxes paid by those "certain commenters" that fuels the utopian fantasies of the rest of the commenters on this site, like NPR? Randi Rhodes, Mike Malloy, Bill Press, and others would be happy to channel Vendicar's warm and civil feelings to you all day.